Ukrainian (украї́нська мо́ва ukrayins'ka mova, pronounced [ukrɑˈjɪɲsʲkɑ ˈmɔwɑ]) is a member of the East Slavic subgroup of the Slavic languages. It is the official state language of Ukraine and the principal language of the Ukrainians. Written Ukrainian uses a variant of the Cyrillic script (see Ukrainian alphabet). The Ukrainian language traces its origins to the Old East Slavic of the early medieval state of Kievan Rus'. From 1804 until the Russian Revolution Ukrainian was banned from schools in the Russian Empire of which Ukraine was a part at the time. It has always maintained a sufficient base in Western Ukraine where the language was never banned in its folklore songs, itinerant musicians, and prominent authors. The standard Ukrainian language is regulated by the National Academy of Sciences of Ukraine (NANU), particularly by its Institute for the Ukrainian Language, Ukrainian language-information fund, and Potebnya Institute of Language Studies. Ukrainian, Russian, Belarusian, and Rusyn have a high degree of mutual intelligibility. Lexically, the closest to Ukrainian is Belarusian (84% of common vocabulary), followed by Polish (70%), Serbo-Croatian (68%), Slovak (66%) and Russian (62%). A point of view developed during the 19th and 20th centuries by linguists of Imperial Russia and the Soviet Union. Like Lomonosov, they assumed the existence of a common language spoken by East Slavs in the past. But unlike Mikhail Lomonosov's hypothesis, this theory does not view Polonization or any other external influence as the main driving force that led to the formation of three different languages: Russian, Ukrainian and Belarusian from the common Old East Slavic language. Ukrainian linguist Stepan Smal-Stotsky went even further, denying the existence of a common Old East Slavic language at any time in the past. Similar points of view were shared by Yevhen Tymchenko, Vsevolod Hantsov, Olena Kurylo, Ivan Ohienko and others. According to this theory, the dialects of East Slavic tribes evolved gradually from the common Proto-Slavic language without any intermediate stages during the 6th through 9th centuries. The Ukrainian language was formed by convergence of tribal dialects, mostly due to an intensive migration of the population within the territory of today's Ukraine in later historical periods. This point of view was also confirmed by Yuri Shevelov's phonological studies and, although it is gaining a number of supporters among Ukrainian academics, it is not seriously regarded outside Ukraine. Outside Ukraine, however, such nationalist-based theories that distance Ukrainian from East Slavic have found few followers among international scholars and most academics continue to place Ukrainian firmly within the East Slavic group, descended from Proto-East Slavic, with close ties to Belarusian and Russian. As the result of close Slavic contacts with the remnants of Scythian and Sarmatian population north of the Black Sea, lasting into the early Middle Ages, is explained the appearance of voiced fricative γ(h) in modern Ukrainian and some southern Russian dialects, that initially emerged in Scythian and the related eastern Iranian dialects from earlier common Proto-Indo-European g* and gh*. Ukrainian traces its roots through the mid-14th century Ruthenian language, a chancellery language of the Grand Duchy of Lithuania, back to the early written evidences of 10th century Rus'. Until the end of the 18th century, the written language used in Ukraine was quite different from the spoken, which is one of the key difficulties in tracing the origin of the Ukrainian language more precisely. There is little direct data on the origin of the Ukrainian language. Scholars rely on indirect methods: analysis of typical mistakes in old manuscripts, comparison of linguistic data with historical, anthropological, archaeological ones, etc. Several theories of the origin of Ukrainian language exist. In the 13th century, eastern parts of Rus' (including Moscow) came under Tatar yoke until their unification under the Tsardom of Muscovy, whereas the south-western areas (including Kiev) were incorporated into the Grand Duchy of Lithuania. For the following four centuries, the language of the two regions evolved in relative isolation from each other. Direct written evidence of the existence of the Ukrainian language dates to the late 16th century. By the 16th century, a peculiar official language was formed: a mixture of Old Church Slavonic, Ruthenian and Polish with the influence of the last of these three gradually increasing. Documents soon took on many Polish characteristics superimposed on Ruthenian phonetics. Polish rule and education also involved significant exposure to the Latin language. Much of the influence of Poland on the development of the Ukrainian language has been attributed to this period and is reflected in multiple words and constructions used in everyday Ukrainian speech that were taken from Polish or Latin. Examples of Polish words adopted from this period include zavzhdy (always; taken from old Polish word zawżdy) and obitsiaty (to promise; taken from Polish obiecać) and from Latin raptom (suddenly) and meta (aim or goal). By the mid-17th century, the linguistic divergence between the Ukrainian and Russian languages was so acute that there was a need for translators during negotiations for the Treaty of Pereyaslav, between Bohdan Khmelnytsky, head of the Zaporozhian Host, and the Russian state. One prominent example of this north-south divergence in Rus' from around 1200, was the epic, The Tale of Igor's Campaign. Like other examples of Old Rus' literature (for example, Byliny, the Primary Chronicle), which survived only in Northern Russia (Upper Volga belt) and was probably created there. The Polish language has had heavy influences on Ukrainian (particularly in Western Ukraine). The southwestern Ukrainian dialects are transitional to Polish. As the Ukrainian language developed further, some borrowings from Tatar and Turkish occurred. Ukrainian culture and language flourished in the sixteenth and first half of the 17th century, when Ukraine was part of the Polish–Lithuanian Commonwealth. Among many schools established in that time, the Kiev-Mogila Collegium (the predecessor of modern Kyiv-Mohyla Academy), founded by the Orthodox Metropolitan Peter Mogila (Petro Mohyla), was the most important. At that time languages were associated more with religions: Catholics spoke Polish language, Orthodox spoke Rusyn language. After the Treaty of Pereyaslav, Ukrainian high culture went into a long period of steady decline. In the aftermath, the Kyiv-Mohyla Academy was taken over by the Russian Empire and closed down later in 19th century. Most of the remaining Ukrainian schools also switched to Polish or Russian in the territories controlled by these respective countries, which was followed by a new wave of Polonization and Russification of the native nobility. Gradually the official language of Ukrainian provinces under Poland was changed to Polish, while the upper classes in the Russian part of Ukraine used Russian. In the Russian Empire Census of 1897 the following picture emerged, with Ukrainian being the second most spoken language of the Russian Empire. According to the Imperial census's terminology, the Russian language (Русскій) was subdivided into Ukrainian (Малорусскій, 'Little Russian'), what we know as Russian today (Вѣликорусскій, 'Great Russian'), and Belarusian (Бѣлорусскій, 'White Russian'). The following table shows the distribution of settlement by native language ("по родному языку") in 1897, in Russian Empire governorates (guberniyas) which had more than 100,000 Ukrainian speakers. Although in the rural regions of the Ukraine provinces, 80% of the inhabitants said that Ukrainian was their native language in the Census of 1897 (for which the results are given above), in the urban regions only 32.5% of the population claimed Ukrainian as their native language. For example, in Odessa, the largest city of Ukraine at this time, only 5.6% of the population said Ukrainian was their native language. Until the 1920s the urban population in Ukraine grew faster than the number of Ukrainian speakers. This implies that there was a (relative) decline in the use of Ukrainian language. For example, in Kiev, the number of people stating that Ukrainian was their native language declined from 30.3% in 1874 to 16.6% in 1917. Officially, there was no state language in the Soviet Union until the very end when it was proclaimed in 1990 that Russian language is the all-Union state language and that the constituent republics had rights to declare additional state languages within their jurisdictions. Still it was implicitly understood in the hopes of minority nations that Ukrainian would be used in the Ukrainian SSR, Uzbek would be used in the Uzbek SSR, and so on. However, Russian was used in all parts of the Soviet Union and a special term, "a language of inter-ethnic communication" was coined to denote its status. In reality, Russian was in a privileged position in the USSR and was the state official language in everything but formal name—although formally all languages were held up as equal. The widening use of Ukrainian further developed in the first years of Bolshevik rule into a policy called korenizatsiya. The government pursued a policy of Ukrainianization by lifting a ban on the Ukrainian language. That led to the introduction of an impressive education program which allowed the Ukrainian taught classes and raised the literacy of the Ukrainophone population. This policy was led by Education Commissar Mykola Skrypnyk and was directed to approximate the language to Russian. Newly generated academic efforts from the period of independence were co-opted by the Bolshevik government. The party and government apparatus was mostly Russian-speaking but were encouraged to learn the Ukrainian language. Simultaneously, the newly literate ethnic Ukrainians migrated to the cities, which became rapidly largely Ukrainianized – in both population and in education. Anti-russification protest. 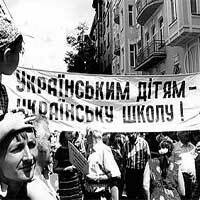 The banner reads "To Ukrainian Children - a Ukrainian school!". While Russian was a de facto official language of the Soviet Union in all but formal name, all national languages were proclaimed equal. The name and denomination of Soviet banknotes were listed in the languages of all fifteen Soviet republics. On this 1961 one-ruble note, the Ukrainian for "one ruble", один карбованець (odyn karbovanets), directly follows the Russian один рубль (odin rubl). After the death of Stalin (1953), a general policy of relaxing the language policies of the past was implemented (1958 to 1963). The Nikita Khrushchev era which followed saw a policy of relatively lenient concessions to development of the languages on the local and republican level, though its results in Ukraine did not go nearly as far as those of the Soviet policy of Ukrainianization in the 1920s. Journals and encyclopedic publications advanced in the Ukrainian language during the Khrushchev era. Yet, the 1958 school reform that allowed parents to choose the language of primary instruction for their children, unpopular among the circles of the national intelligentsia in parts of the USSR, meant that non-Russian languages would slowly give way to Russian in light of the pressures of survival and advancement. The gains of the past, already largely reversed by the Stalin era, were offset by the liberal attitude towards the requirement to study the local languages (the requirement to study Russian remained). Parents were usually free to choose the language of study of their children (except in few areas where attending the Ukrainian school might have required a long daily commute) and they often chose Russian, which reinforced the resulting Russification. In this sense, some analysts argue that it was not the "oppression" or "persecution", but rather the lack of protection against the expansion of Russian language that contributed to the relative decline of Ukrainian in 1970s and 1980s. According to this view, it was inevitable that successful careers required a good command of Russian, while knowledge of Ukrainian was not vital, so it was common for Ukrainian parents to send their children to Russian-language schools, even though Ukrainian-language schools were usually available. While in the Russian-language schools within the republic, Ukrainian was supposed to be learned as a second language at comparable level, the instruction of other subjects was in Russian and, as a result, students had a greater command of Russian than Ukrainian on graduation. Additionally, in some areas of the republic, the attitude towards teaching and learning of Ukrainian in schools was relaxed and it was, sometimes, considered a subject of secondary importance and even a waiver from studying it was sometimes given under various, ever expanding, circumstances. The management of dissent by the local Ukrainian Communist Party was more fierce and thorough than in other parts of the Soviet Union. As a result, at the start of the Mikhail Gorbachev reforms, Ukraine under Shcherbytsky was slower to liberalize than Russia itself. Modern signs in the Kiev Metro are in Ukrainian. The evolution in their language followed the changes in the language policies in post-war Ukraine. Originally, all signs and voice announcements in the metro were in Ukrainian, but their language was changed to Russian in the early 1980s, at the height of Shcherbytsky's gradual Russification. In the perestroika liberalization of the late 1980s, the signs were changed to bilingual. This was accompanied by bilingual voice announcements in the trains. In the early 1990s, both signs and voice announcements were changed again from bilingual to Ukrainian-only during the de-russification campaign that followed Ukraine's independence. From 2012 the signs are both in Ukrainian and English. With time, most residents, including ethnic Russians, people of mixed origin, and Russian-speaking Ukrainians started to self-identify as Ukrainian nationals, even those who remained Russophone. The Russian language however still dominates the print media in most of Ukraine and private radio and TV broadcasting in the eastern, southern, and to a lesser degree central regions. The state-controlled broadcast media have become exclusively Ukrainian. There are few obstacles to the usage of Russian in commerce and it is still occasionally used in government affairs. Ethnic minorities, such as Romanians, Tatars and Jews usually use Russian as their lingua franca. But there are tendencies within these minority groups to use Ukrainian. The Jewish writer Olexander Beyderman from the mainly Russian speaking city of Odessa is now writing most of his dramas in Ukrainian. The emotional relationship regarding Ukrainian is changing in southern and eastern areas. The use of the Ukrainian language is increasing after a long period of decline. Although there are almost fifty million ethnic Ukrainians worldwide, including 37.5 million in Ukraine (77.8% of the total population), the Ukrainian language is prevalent only in western and central Ukraine. In Kiev, both Ukrainian and Russian are spoken, a notable shift from the recent past when the city was primarily Russian speaking. The shift is believed to be caused, largely, by an influx of the rural population and migrants from the western regions of Ukraine but also by some Kievans' turning to use the language they speak at home more widely in everyday matters. Public signs and announcements in Kiev are in Ukrainian. In southern and eastern Ukraine, Russian is the prevalent language of the urban population. According to the Ukrainian Census of 2001, 87.8% people living in Ukraine communicate in Ukrainian. (4) Middle Dnieprian is the basis of the Standard Literary Ukrainian. It is spoken in the central part of Ukraine, primarily in the southern and eastern part of the Kiev Oblast). In addition, the dialects spoken in Cherkasy, Poltava and Kiev regions are considered to be close to "standard" Ukrainian. A Kuban dialect related to or based on the Steppe dialect is often referred to as Balachka and is spoken by the Kuban Cossacks in the Kuban region in Russia by the descendants of the Zaporozhian Cossacks, who settled in that area in the late 18th century. It was formed from gradual mixture of Russian into Ukrainian. This dialect features the use of some Russian vocabulary along with some Russian grammar. There are 3 main variants which have been grouped together according to location. (12) Hutsul is spoken by the Hutsul people on the northern slopes of the Carpathian Mountains, in the extreme southern parts of the Ivano-Frankivsk Oblast, as well as in parts of the Chernivtsi and Transcarpathian Oblasts. (8) Podillian is spoken in the southern parts of the Vinnytsia and Khmelnytskyi Oblasts, in the northern part of the Odessa Oblast, and in the adjacent districts of the Cherkasy Oblast, the Kirovohrad Oblast and the Mykolaiv Oblast. (9) Upper Dniestrian is considered to be the main Galician dialect, spoken in the Lviv, Ternopil and Ivano-Frankivsk Oblasts. Its distinguishing characteristics are the influence of Polish and the German vocabulary, which is reminiscent of the Austro-Hungarian rule. Some of the distinct words used in this dialect can be found here. Ukrainian is also spoken by a large émigré population, particularly in Canada (see Canadian Ukrainian), United States and several countries of South America like Brazil, Argentina and Paraguay. The founders of this population primarily emigrated from Galicia, which used to be part of Austro-Hungary before World War I, and belonged to Poland between the World Wars. The language spoken by most of them is the Galician dialect of Ukrainian from the first half of the 20th century. Compared with modern Ukrainian, the vocabulary of Ukrainians outside Ukraine reflects less influence of Russian, but often contains many loan words from the local language. Old East Slavic (and Russian) o in closed syllables, that is, ending in a consonant, in many cases corresponds to a Ukrainian i, as in pod->pid (під, 'under'). Thus, in the declension of nouns, the o can re-appear as it is no longer located in a closed syllable, such as rik (рік, 'year') (nom): rotsi (loc) (році). The Ukrainian language has six vowels, /ɑ/, /ɛ/, /ɪ/, /i/, /ɔ/, /u/, and two approximants /j/, /w/. The letter г represents different consonants in Old East Slavic and Ukrainian. Ukrainian г /ɦ/, often transliterated as Latin h, is the voiced equivalent of Old East Slavic х /x/. The Russian (and Old East Slavic) letter г denotes /ɡ/. Russian-speakers from Ukraine and Southern Russia often use the soft Ukrainian г, in place of the hard Old East Slavic one. The Ukrainian alphabet has the additional letter ґ, for representing /ɡ/, which appears in some Ukrainian words such as gryndžoly (ґринджоли, 'sleigh') and gudzyk (ґудзик, 'button'). However, the letter ґ appears almost exclusively in loan words, and is usually simply written г due to the relative unavailability of the letter. For example, loanwords from English on public signs usually use г for both English "g" and "h". This sound is still more rare in Ukrainian than in Czech or Slovak. Another phonetic divergence between the two languages is the pronunciation of "v", the Cyrillic в. While in standard Russian it represents /v/, in many Ukrainian dialects it denotes /w/ (following a vowel and preceding a consonant (cluster), either within a word or at a word boundary, it denotes the allophone [u̯], and like the off-glide of in the English words "flow" and "cow", it forms a diphthong with the preceding vowel). Native Russian-speakers will pronounce the Ukrainian в as /v/, whereas Ukrainians will often use /w/, which is one way to tell the two groups apart. As with г above, Ukrainians use в to spell both English "v" and "w"; Russians tend to instead opt for using у for "w". The letter щ represents two consonants [ʃt͡ʃ]. The combination of [j] with some of the vowels is also represented by a single letter ([jɑ] = я, [jɛ] = є, [ji] or [jı̽] = ї, [ju] = ю), while [jo] = йо and the rare regional [jɪ] = йи are written using two letters. These iotated vowel letters and a special soft sign change a preceding consonant from hard to soft. An apostrophe is used to indicate the hardness of the sound in the cases when normally the vowel would change the consonant to soft; in other words, it functions like the yer in the Russian alphabet. The Dictionary of Ukrainian Language in 11 volumes contains 135,000 entries. Lexical card catalog of Ukrainian Institute of Language Studies has 2.5 million cards. The same Institute is going to publish the new Dictionary of Ukrainian Language in 13 volumes. The question of whether contemporary Ukrainian and Russian (as well as Belarusian and Rusyn) are dialects of a single language or separate languages is not entirely decided by linguistic factors alone because there is a high degree of mutual intelligibility. As members of the East Slavic group of languages, they are descended from a common ancestor. Although Ukrainian, Russian, and Belarusian are usually listed by linguists as separate languages, some linguistic references list them as dialects of a single language. Within East Slavic, the Ukrainian language is most closely related to Belarusian. It is accepted that before the 18th century, the precursor to the modern literary Ukrainian language was a vernacular used mostly by peasants and petits bourgeois, as no traces of earlier literary works could be found. It existed along with Church Slavonic, a literary language of religion that evolved from the Old Slavonic and which was the language usually used in writing and communication. Like all Slavic languages with the exception of Russian, Slovak and Slovene, the Ukrainian language has preserved the Common Slavic vocative case. When addressing one's sister (sestra) she is referred to as sestro. In the Russian language the vocative case has been almost entirely replaced by the nominative (except for a handful of vestigial forms, e.g. Bozhe and Gospodi "Lord!"). The Ukrainian language, in common with all Slavic languages other than Russian, Slovak and Slovene has retained the Common Slavic dative & locative endings -ce, -ze, and -se in the female declension. For example, "hand" (ruka) becomes ruci. In Russian, dative and locative of (ruka) would be ruke. The Ukrainian language, in common with Serbo-Croatian and Slovene, has developed the ending -mo for first-person plurals in verbs (khodymo for "we walk"). In all cases, it came from lengthening the Common Slavic -mŭ. The Ukrainian language, in common with Russian and Belarusian, has changed the Common Slavic word beginning ye- into o, such as in the words ozero (lake) and odyn (one). The Ukrainian language, in common with Czech, Slovak, Upper Sorbian, Belarusian and southern Russian dialects has changed the Common Slavic "g" into an "h" sound (for example, noha – leg). The Ukrainian language, in common with Russian, Belarusian, Bulgarian, Croatian, Macedonian, Slovene and Serbian has simplified the Common Slavic tl and dl into l (for example, mela – she swept"). ^ a b "Юрій Шевельов. Історична фонологія української мови". Litopys.org.ua. http://www.litopys.org.ua/shevelov/shev.htm. Retrieved 2012-05-22. ^ Nimchuk, Vasyl'. Періодизація як напрямок дослідження генези та історії української мови. Мовознавство. 1997.- Ч.6.-С.3-14; 1998. ^ "Григорій Півторак. Походження українців, росіян, білорусів та їхніх мов". Litopys.org.ua. http://litopys.org.ua/pivtorak/pivt.htm. Retrieved 2012-05-22. ^ "Мова (В.В.Німчук). 1. Історія української культури". Litopys.org.ua. http://litopys.org.ua/istkult/ikult01.htm. Retrieved 2012-05-22. ^ "The three modern East Slavic languages are Russian, Ukrainian and Belarusian. 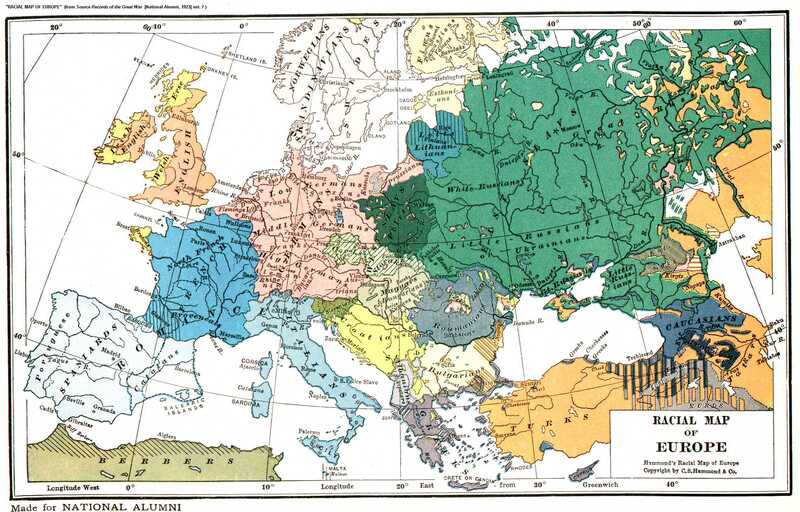 As a linguistic group they are more homogeneous than South or West Slavic." Roland Sussex and Paul Cubberley. The Slavic Languages (2010, Cambridge), pg. 79 et passim. "There is little doubt, however, that by the ninth century there emerged at least three distinct dialects, South Slavonic, East Slavonic and West Slavonic, the latter two grouped as North Slavonic." Alexander M. Schenker. "Proto-Slavonic", The Slavonic Languages (1993, Routledge), pg. 114; and "East Slavonic split first into South-Western and North-Eastern (Russian) variants, the former being the forerunner of Ukrainian and Belorussian," pg. 116. ^ "Лаврентій Зизаній. "Лексис". Синоніма славеноросская". Litopys.org.ua. http://litopys.org.ua/zyzlex/zyz.htm. Retrieved 2012-05-22. ^ "The Polonization of the Ukrainian Nobility". Mywebpages.comcast.net. http://mywebpages.comcast.net/mdemkowicz1/dobra/poloniz.html. Retrieved 2012-05-22. ^ Geoffrey Hull, Halyna Koscharsky. "Contours and Consequences of the Lexical Divide in Ukrainian". Australian Slavonic and East European Studies. Vol. 20, no. 1-2. 2006. pp. 140-147. ^ "XII. СКОРПІОНИ НА УКРАЇНСЬКЕ СЛОВО. Іван Огієнко. Історія української літературної мови". Litopys.org.ua. http://litopys.org.ua/ohukr/ohu14.htm. Retrieved 2012-05-22. ^ "Демоскоп Weekly - Приложение. Справочник статистических показателей". Demoscope.ru. http://demoscope.ru/weekly/ssp/rus_lan_97.php. Retrieved 2012-05-22. ^ "Law on Languages of Nations of USSR". Legal-ussr.narod.ru. 1990-04-24. http://legal-ussr.narod.ru/data01/tex10935.htm. Retrieved 2012-05-22. ^ "Welcome to Ukraine (See above)". http://www.wumag.kiev.ua/index2.php?param=pgs20032/72. Retrieved November 19, 2005. ^ "Діалект. Діалектизм. Українська мова. Енциклопедія". Litopys.org.ua. http://litopys.org.ua/ukrmova/um156.htm. Retrieved 2012-05-22. ^ "Інтерактивна мапа говорів. Українська мова. Енциклопедія". Litopys.org.ua. http://litopys.org.ua/ukrmova/um184.htm. Retrieved 2012-05-22. ^ "Північне наріччя. Українська мова. Енциклопедія". Litopys.org.ua. http://litopys.org.ua/ukrmova/um161.htm. Retrieved 2012-05-22. ^ "ІЗБОРНИК. Історія України IX-XVIII ст. Першоджерела та інтерпретації. Нульова сторінка". Litopys.org.ua. http://litopys.org.ua/ukrmova/um155.ht. Retrieved 2012-05-22. ^ "Середньополіський говір. Українська мова. Енциклопедія". Litopys.org.ua. http://litopys.org.ua/ukrmova/um167.htm. Retrieved 2012-05-22. ^ "Maps of Belarus: Dialects on Belarusian territory". Belarusguide.com. http://www.belarusguide.com/as/map_text/havorki.html. Retrieved 2012-05-22. ^ "Південно-східне наріччя. Українська мова. Енциклопедія". Litopys.org.ua. http://litopys.org.ua/ukrmova/um160.htm. Retrieved 2012-05-22. ^ "Слобожанський говір. Українська мова. Енциклопедія". Litopys.org.ua. http://litopys.org.ua/ukrmova/um169.htm. Retrieved 2012-05-22. ^ "Степовий говір. Українська мова. Енциклопедія". Litopys.org.ua. http://litopys.org.ua/ukrmova/um171.htm. Retrieved 2012-05-22. ^ "Mapa ukrajinskich howoriv". Harazd.net. http://harazd.net/~nadbuhom/mapy-historia/mapy_8.htm. Retrieved 2012-05-22. ^ "Південно-західне наріччя. Українська мова. Енциклопедія". Litopys.org.ua. http://litopys.org.ua/ukrmova/um159.htm. Retrieved 2012-05-22. ^ "Подільський говір. Українська мова. Енциклопедія". Litopys.org.ua. http://litopys.org.ua/ukrmova/um180.htm. Retrieved 2012-05-22. ^ "Короткий словник львівської ґвари". Ji.lviv.ua. http://www.ji.lviv.ua/n36-1texts/gwara.htm. Retrieved 2012-05-22. ^ "Ethnologue report for Russian Federation (Asia)". Ethnologue.com. http://www.ethnologue.com/show_country.asp?name=RUA. Retrieved 2012-05-22. ^ "Население Российской Федерации по владению языками" (in Russian). http://www.perepis-2010.ru/results_of_the_census/tab6.xls. ^ "Various Languages Spoken". Statistics Canada. 2001. http://www12.statcan.ca/english/census01/products/standard/themes/RetrieveProductTable.cfm?Temporal=2001&PID=55539&APATH=11&GID=431515&METH=1&PTYPE=55440&THEME=41&FOCUS=0&AID=0&PLACENAME=0&PROVINCE=0&SEARCH=0&GC=99&GK=NA&VID=0&VNAMEE=&VNAMEF=&FL=0&RL=4&FREE=0. Retrieved 2008-02-03. ^ "Detailed Language Spoken at Home". Statistics Canada. 2001. http://www12.statcan.ca/english/census01/products/standard/themes/RetrieveProductTable.cfm?Temporal=2001&PID=55536&APATH=11&GID=431515&METH=1&PTYPE=55440&THEME=41&FOCUS=0&AID=0&PLACENAME=0&PROVINCE=0&SEARCH=0&GC=99&GK=NA&VID=0&VNAMEE=&VNAMEF=&FL=0&RL=4&FREE=0. Retrieved 2008-02-03. ^ Неофициальный сайт Президента ПМР. "The Constitution of Transnistria, Article 12". President-pmr.org. http://president-pmr.org/. Retrieved 2012-05-22. ^ "Stechishin-1958". Wals.info. http://wals.info/refdb/record/Stechishin-1958. Retrieved 2012-05-22. Nimchuk, Vasyl'. Періодизація як напрямок дослідження генези та історії української мови. Мовознавство. 1997.- Ч.6.-С.3-14; 1998. This page uses content from the English language Wikipedia. The original content was at Ukrainian language. The list of authors can be seen in the page history. As with this Familypedia wiki, the content of Wikipedia is available under the Creative Commons License.